I had no expectations when I ordered this book on Audible, only that it was recommended based on a few other “running” books I have read in the past. 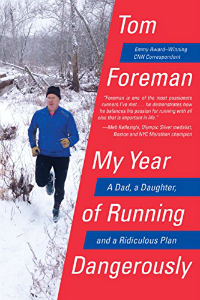 In this book, CNN correspondent Tom Foreman decides to start running again when his 18-year old daughter asks him to run a marathon with her. CNN correspondent Tom Foreman’s remarkable journey from half-hearted couch potato to ultra-marathon runner, with four half-marathons, three marathons, and 2,000 miles of training in between; a poignant and warm-hearted tale of parenting, overcoming the challenges of age, and quiet triumph. My Year of Running Dangerously is Foreman’s journey through four half-marathons, three marathons, and one 55-mile race. What started as an innocent request from his daughter quickly turned into a rekindled passion for long-distance running—for the training, the camaraderie, the defeats, and the victories. Told with honesty and humor, Foreman’s account captures the universal fears of aging and failure alongside the hard-won moments of triumph, tenacity, and going further than you ever thought possible.